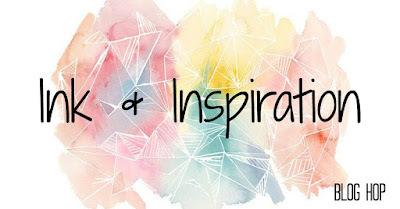 Welcome to the final installment of Ink & Inspiration for 2017! I have had a lot of fun hopping with this fab crew & can't wait to share in some more good times in 2018. 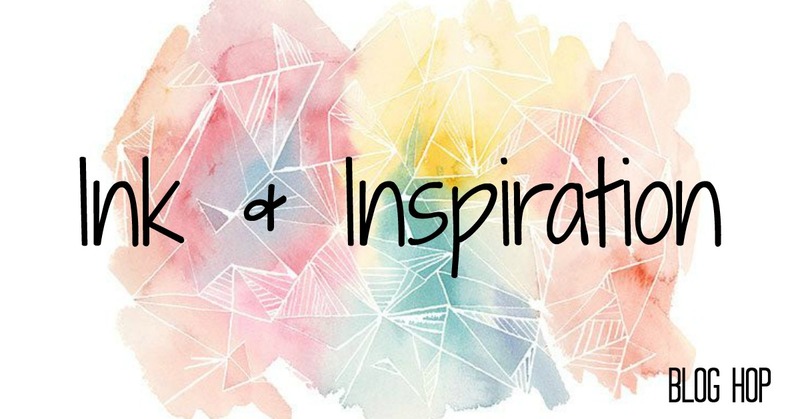 We have a pretty fun list of themes set up for you & some amazing new people joining us! You are currently visiting Jessie Holton from Australia. Today we are making a Fancy Fold or 3D project. 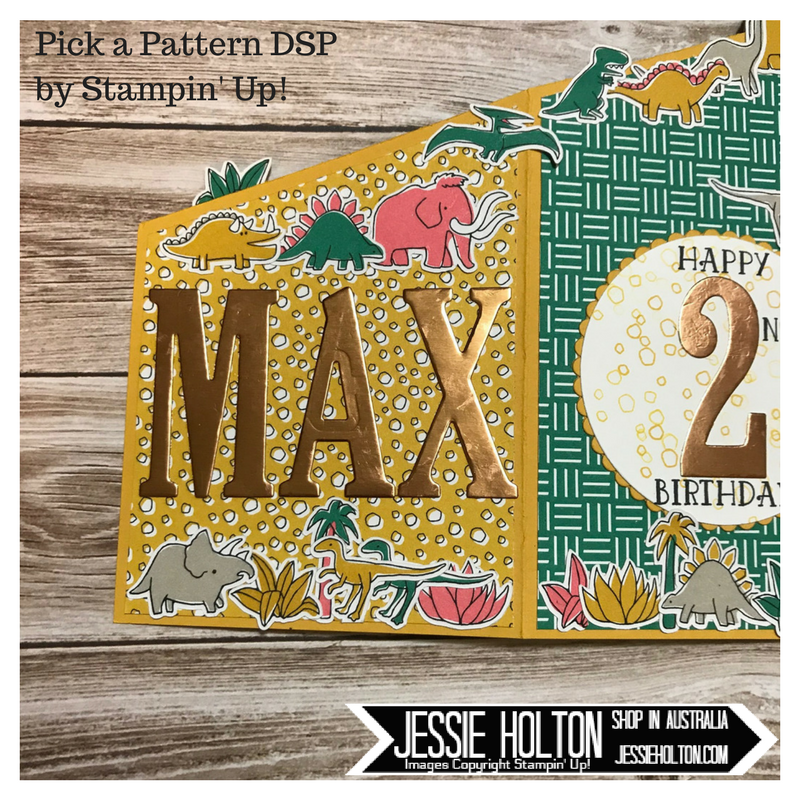 I have decided to make a fancy fold card as I have always shied away from these & I thought it might be fun to make something a bit different for my nephew's 2nd birthday in early January. 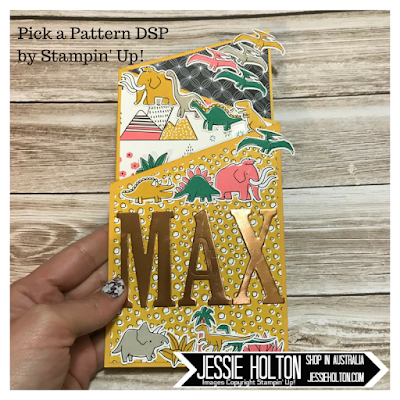 I have chosen a dinosaur theme with the bright & super cute Pick a Pattern Designer Series Paper (DSP). Because what little 2yo boy doesn't like dinosaurs, right? I think this fold is called a cascade fold but please correct me if I'm wrong haha! I have seen these done a few times & thought it might be a relatively fail safe one to start out with. I have used a Crushed Curry A4 cardstock base & sliced a slope off it where I thought it looked good. Then I divided the length by three & scored for the folds - the scores are at 9.9cm each. I then cut some fun patterned paper from the Pick a Pattern DSP to fit. I find the easiest way for me to do this is to just hold the paper over the area I want to cover & then use my fingernail to mark where to cut it, rather than measuring it. I've also fussy cut a bunch of the dinosaurs, trees & ferns to create the little scenes. 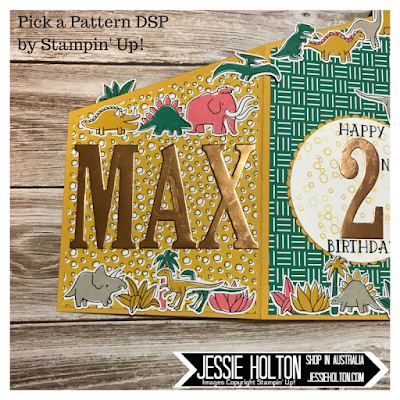 I have used the same dinosaurs, but facing the opposite direction for the middle panel, so whichever side you're looking at, they line up. 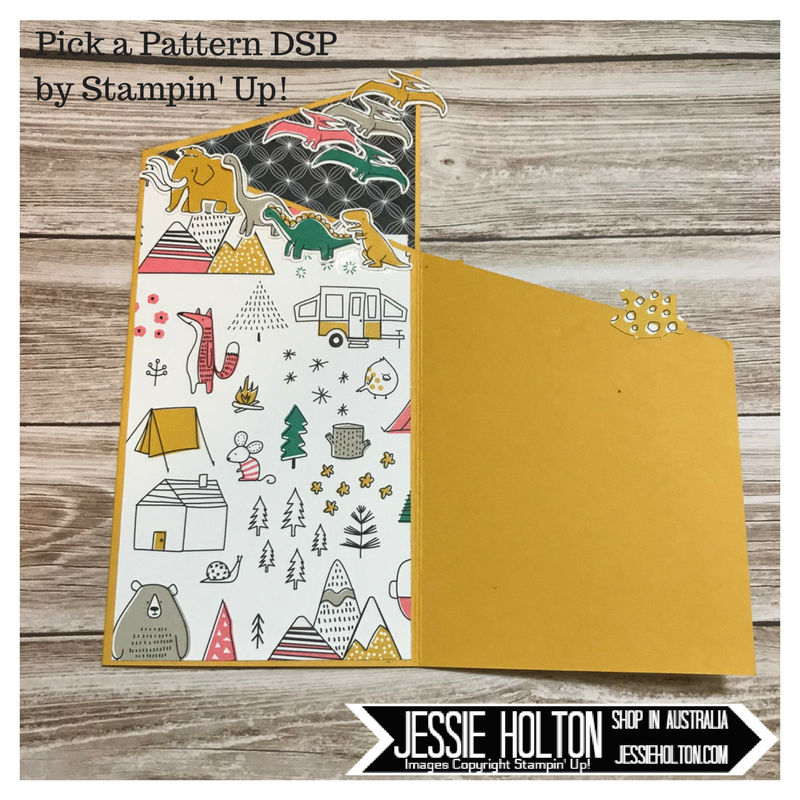 I wanted to use some of this cute print with the mountains on it for the background of my dinosaurs, but when the card was closed, a little fox's head stuck out over the top & he looked a bit out of place. So, I have glued a little fern to the back of the front panel so that when you open it up, there isn't just a little fox with a fern stuck on his head haha! I have used Copper Foil & the Large Letters for 'Max' & Large Numbers framelits for the number 2. 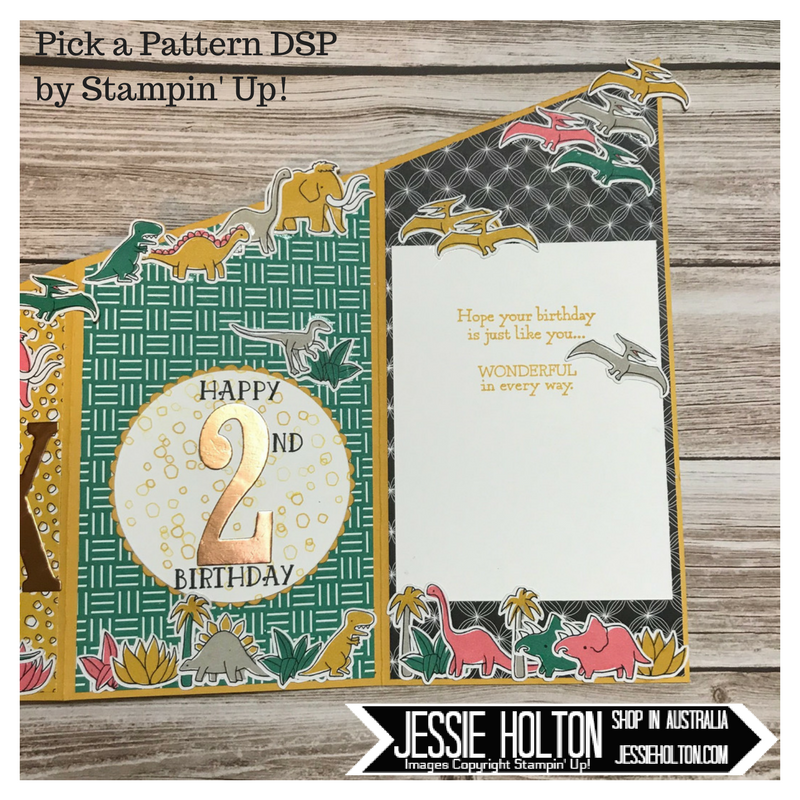 The sentiments around the number 2 come from the Numbers for You stamp set & I have used the Layering Circles to cut Whisper White & the scalloped edge Crushed Curry circles. 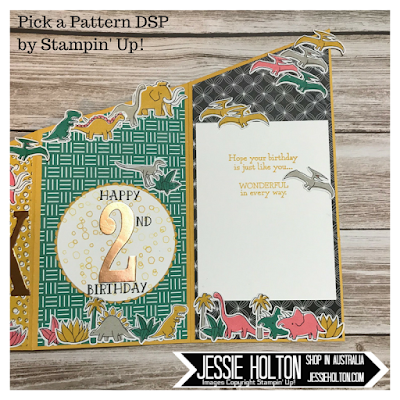 The bubbles come from the coordinating Pieces & Patterns stamp set, inked in Crushed Curry & some of them are stamped off. 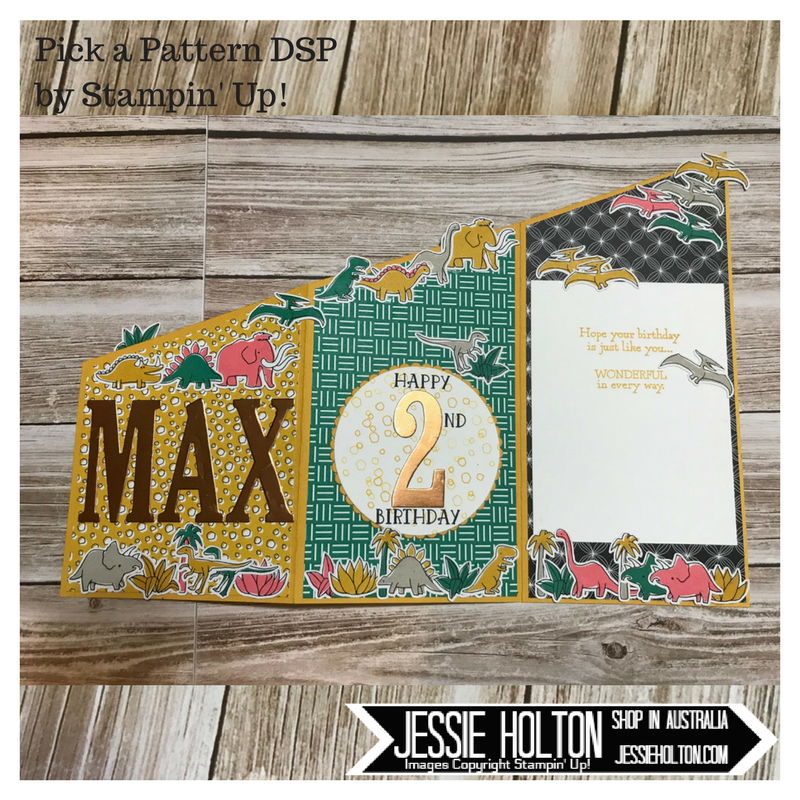 The Crushed Curry sentiments on the last panel come from the Pretty Kitty stamp set. 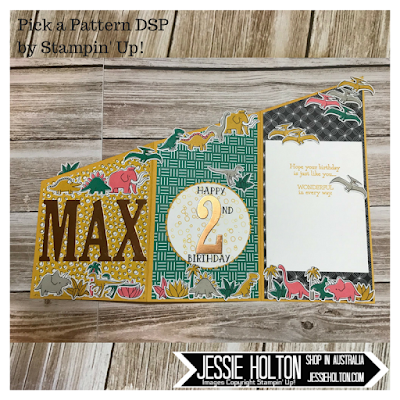 I don't usually mix my stamps & product suites like this, but I'm really happy with how this card has turned out for Max. I hope you have enjoyed my card, too. 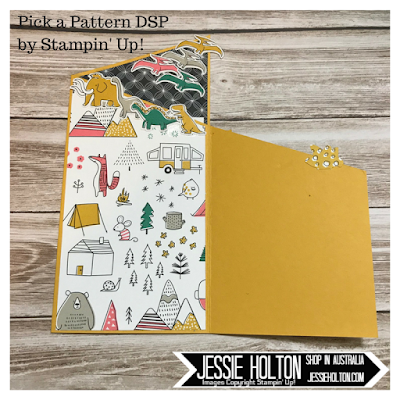 I have also made a custom envelope with the yellow stripe print from the Pick a Pattern DSP & my Envelope Punch Board (not pictured). Please make your way around the rest of the crew, I can't wait for you to see what they've got in store for you! You are currently visiting Jessie Holton from Australia.